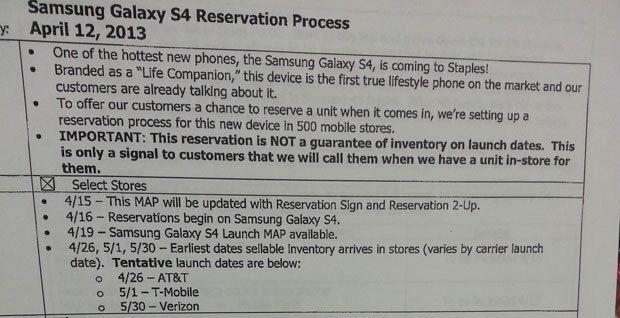 According to a “leaked” Staples store training sheet we could see an April 26th release date for the Samsung Galaxy S4 on AT&T, nearly a week before T-Mobile and Verizon get their hands on the next Galaxy phone. The letters do state that these dates are not guaranteed, and are subject to change, so we take these dates as a pinch of salt really. The Staples document, which is dated April 12, 2013 shows that the stores will be setting up signage today, whilst taking reservations tomorrow, and the earliest date they will be available for store purchase shows April 26th, which is the date that AT&T get the phone. Are you a Galaxy fan looking forward to the imminent release of the S4?